Use this to add videos to your skin. You can use local files, URLs or YouTube and Vimeo IDs. Select it in the Toolbar and click and drag in the Canvas to add the element. Go the Elements menu and select Video. Click and drag in the Canvas to add the element. File - To use a video from a local file. You can choose an optional poster frame (Poster Frame File) which is a preview image of the video. It is displayed until the video starts playing. URL - To use a video from a URL. Enter the URL of the video and its poster frame URL. YouTube - To embed a YouTube video. Paste the URL of a YouTube video into the YouTube ID field. When you do, you’ll see the video ID as a link. Click on this to check it is the correct video (it will open the page in a browser). You cannot mute the audio of YouTube videos. Vimeo - To embed a Vimeo video. Paste the URL of a Vimeo video into the Vimeo ID field. When you do, you’ll see the video ID as a link. Click on this to check it is the correct video (it will open the page in a browser). You cannot hide the Vimeo movie controls or mute the audio. Autoplay - To automatically start the video. Controls - To show playback controls inside the video. Loop - To continuously loop the video. Mute - To mute the video’s audio. Loading – Unload video on hide - Select to unload the video when it gets hidden through a skin action. This also stops the sound of the video. ✭ Tip: Use an action to show and hide the video. 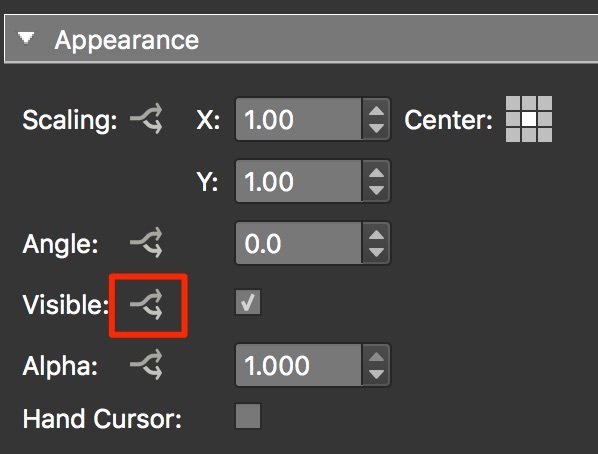 Click the arrows next to Visible to open the Logic Block for visibility. This expression states that when the video is not playing it will not be visible; it will hide itself. ✭ Note: Using the Active trigger will not work with YouTube and Vimeo videos. 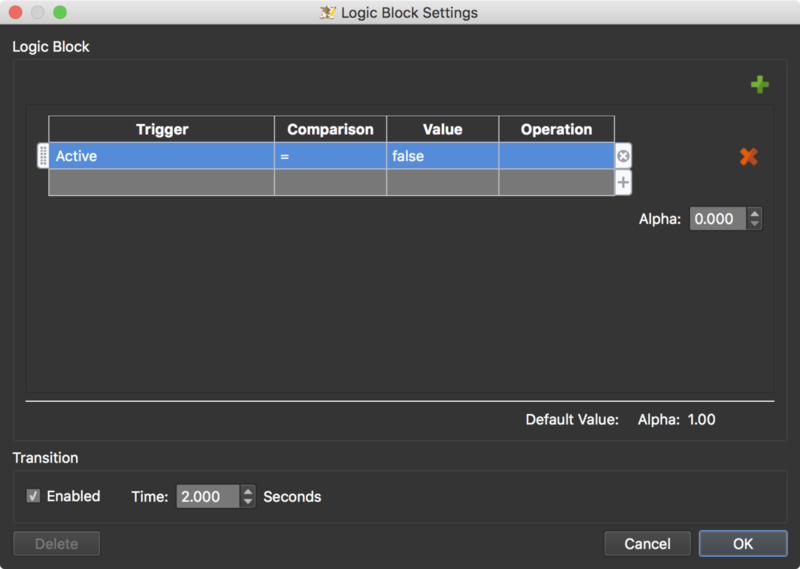 Click the arrows next to Alpha to open the Logic Block for visibility. This expression states that when video is not playing (not active), it hide itself with a transition from full opacity to transparent. So, if you have a button that toggles play and pause, for example, the video will fade in and out. Sometimes, a video’s container does not match the video’s aspect ratio. When this happens you have a few ways to solve the problem. Do nothing and just add the video to the element. The video will then resize itself to fit within the borders of the container. Black bars may appear left/right or top/bottom. Open the video element’s Advanced pane. In the field for CSS Style, add overflow: hidden. And for ‘CSS Styles Inner Element, add object-fit: cover. ✭ Note that this will work only for Video files and URLs but not for YouTube and Vimeo videos.